PoJo's Pokemon & Other Way Cool Stuff is out! 05.07.01 The June 2001 issue of Pojo's Pokemon News & Price Guide is on sale now. This is our last issue. 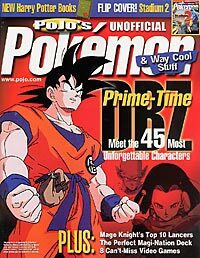 You may find some "specials" of DBZ, Pokemon, Magic, Digimon, etc. ... but the monthly run is over with this issue. But man, it was fun!!! A great two part feature on the Girls of Pokemon. Kittyfox did a phenomenal job with this article! The Top 15 Pokemon Cards by Underdog! A 4 page interview with Dark Master Trainer Mike of Wizards of the Coast! A Pokemon Stadium 2 Survival Guide! Pojo's Puzzler - This month by Ness! Single Card Strategies from Kittyfox, Doll, Jason K, & Gym Leader Phil. Deck Garage fixes from GLitcH & Satoshi. Killer Decks from FlareonMaster & PokeSensei! Our Killer Price Guide, Fan Art, Fan Letters, News & a Whole lot more. Meet the 45 Most Unforgettable Characters in Dragon Ball Z! Building the perfect Magi-Nation Deck by El Ravager! The Top 10 New Mage Knight Lancer figures (with images) by Michael Yates! Hot Video Games, Anime News & More!